In the inaugural edition of the Benson & Hedges Gold Cup in 1972, Roberto established himself as a truly great horse. Many racing observers believed Rheingold was the better horse and should have won the Epsom Derby. Superstar jockey Lester Piggott too shared this view and after Roberto had run poorly in his previous start, for the Benson & Hedges Gold Cup Piggott abandoned Roberto to ride Rheingold. However, it was the entry of the formidable 4-year-old Brigadier Gerard that generated enormous publicity for the race. Undefeated in fifteen career starts, Brigadier Gerard was seen as invincible. Having lost jockey Piggott, Roberto’s owner John Galbreath flew in the Panamanian-born American jockey Braulio Baeza. Riding for the first time on an English racetrack, according to Raceform, a leading publisher of U.K. horseracing information, Braulio Baeza aboard “Roberto was out of the stalls like a bat out of hell.” Baeza rode Roberto as he’d never been ridden before. Shocked racing fans watched as the colt never looked back, he jumped him out to set a scorching pace, winning unchallenged in new course record time and handing Brigadier Gerard his only defeat, beating the illustrious champion by three lengths. Baeza employed similar tactics in the Prix de l’Arc de Triomphe later that season, but the going wasn’t as fast as at York and Roberto was soon swamped to finish seventh. Roberto’s Timeform rating of 131 as a 3 year old put him some way behind Brigadier Gerard (144) and Mill Reef (141) in the same year, and puts some perspective on his achievements as a racehorse. Roberto was named Champion 3-year-old colt in Ireland and England in 1972. Roberto was bred by John Galbreath at his Darby Dan Farm in Kentucky, and was born in 1969. 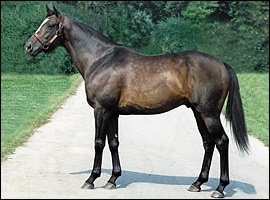 By successful sire Hail To Reason out of Bramalea, Roberto’s grandsire was Turn-To, a descendant of Nearco, and his damsire was the U.S. Hall of Famer, Nashua. He was named for Major League Baseball star Roberto Clemente by his owner John Galbreath who also owned the Pittsburgh Pirates baseball team. Roberto, still owned by Galbreath, was sent to Ireland to be trained by Vincent O’Brien. Roberto obliterated most of the opposition in his first three starts, culminating in a five lengths’ win in the Curragh National Stakes Grade 2, the most important event for juveniles in Ireland. He won the Anglesey Stakes Gr 3, Lagan Stakes and a fourth Longchamp Grand Criterium Gr 1. General opinion was that Lester Piggott had left the short-priced favourite with too much to do in the straight of the Grand Criterium. Roberto began his 3YO campaign with an easy win on heavy going in Ireland, before tackling 2000 Guineas favourite High Top at Newmarket. He came from well off the pace to get to High Top’s girth at the line, with the third horse six lengths back. Due to his impressive 2-year-old campaign, he earned 1971 Irish Champion colt award at age 3. His wins include the Epsom Derby Group 1, York Benson and Hedges Gold Cup Gr 1, Phoenix Park Vauxhall Trial Stakes Gr 3, a second Newmarket 2000 Guineas Gr 1, and the Longchamp Prix Niel Gr 3. Ridden by Lester Piggott, Roberto defeated Rheingold by a head to capture the 1972 Epsom Derby, the most prestigious race in the United Kingdom. The victory made John Galbreath the first person to own winners of both the English and American Derbies, having also won the 1963 Kentucky Derby with Chateaugay and the 1967 Kentucky Derby with Proud Clarion. Roberto raced at age four, three times, notably winning the prestigious Epsom Coronation Cup Gr 1 and a second in the Leopardstown Nijinsky Stakes Listed. After winning the Coronation Cup with ridiculous ease, he then ran unplaced in the King George VI and Queen Elizabeth Stakes behind Rheingold after trying to make all the running. Piggot got the blame again on the latter occasion, for going too fast. His total career earnings were $339,902, with 14 starts, 7 wins and 3 places. Roberto was syndicated in 32 shares of $100,000 each at the end of his 4 year old career, to stand at his owner’s Darby Dan Farm in Kentucky. Described as a well-made individual, though not handsome or imposing, with a long, low action and being a really good mover. There are conflicting reports about his temperament – Monty Roberts describes Roberto in his book “The Man Who Listens To Horses” as a violent stallion, along with Ribot and Graustark, and it is said he passed on this bad temperament to his sons. Roberto was the leading freshman sire in 1977 both in the USA and England, in the latter through champion 2 year old Sookera. He made his mark consistently in subsequent years, getting a total of 87 stakes winners to his credit. A large number of his sons took their chance at stud, and successfully so. 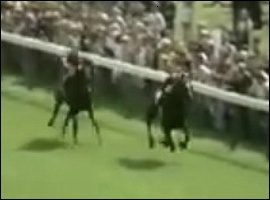 In 2003, sons of Roberto provided the winners of both the English Derby (by Kris S) and English Oaks (by Red Ransom). 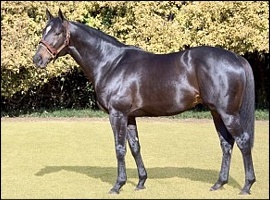 He has become an influential broodmare sire in international breeding, as have many of his sire sons. Roberto stood at Darby Dan until his death in 1988. He finished his career with 17% stakes winners to foals, his stud fee having climbed to $225,000. Among his notable offspring were 1988 Eclipse Award turf champion Sunshine Forever; Real Shadai, the leading sire in Japan in 1993; Australia Melbourne Cup winner At Talaq; British Classic winner Touching Wood; outstanding sire Kris S., who produced five Breeders’ Cup winners; and Dynaformer who sired 2006 Kentucky Derby winner Barbaro. 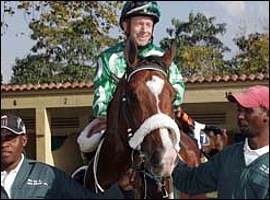 In South Africa he will be best remembered by his son who produced a remarkable number of Champions, as well as making a name for himself as a Broodmare Sire, in the form of Al Mufti. Roberto’s other descendants include The Sheik, Modern Day, Call To Combat and Slew The Red, all standing on farms in KZN. The Sheik, a multiple Grade 1 winner and 6-time winner by Al Mufti, currently stands at the Scott Brothers’ Highdown Stud. He is out of Jessamine by Del Sarto. He has produced Knight To Remember, a grey gelding who has placed third in both the Gold Vase Grade 2 and the Canon Gold Cup Grade 1. He also has Grade 3 placed Carina Coleman and Asian Affair, who ran a second in the Sunday Tribune Umzimkhulu Grade 3 over 1400m. Sheikitupbaby is the winner of the Listed Spook Express Handicap. Modern Day who currently resides at Middlefield Stud, is by Dayjur out of a Roberto mare. At the age of 5 he won the Grade 3 Kings Cup Handicap and had 9 wins in total between the UK and South Africa. He has proved himself to be a most consistent stallion in KZN. His winners include the likes of Surfin’ USA, Modern Monet, Apple-A-Day, Modern Quest to name but a few. His damline boasts the likes of Zafonic (sire of Xaar), Zamindar, and he is a half-sister to Grade 1 Epsom Oaks winner – the very talented mare Reams Of Verse. His two half-brothers Elmaamul and Modernise are each standing at stud overseas. Roberto’s other descendants in South Africa include a new stallion for the KZN season, Call To Combat, owned by Graystone Stud and standing at Hadlow Stud, alongside Jam Alley. Call To Combat is by Announce (Roberto being the broodmare sire) out of a Gamaliya by Rakeen. He is a 7-time winner, and placed 7 times, winning a Listed race and placing in the Grade 2 Victory Moon Stakes. He covered his first book of mares this season. The last one in KZN is Slew The Red, standing at Invermooi Stud. By Red Ransom (Roberto being the sire), he is out of Great Lady Slew by Seattle Slew. From 52 runners, he has had 22 winners. His notable progeny include Two Moccasins who placed in the Grade 3 Strelitzia Stakes. Phunyuka is another, winner of the Grade 2 Emerald Cup, Africa’s richest race on dirt with Littleredcorvette placing in two Listed races to date. Roberto died on 2 August, 1988, aged nineteen at Darby Dan Farm and he is buried in their equine cemetery.